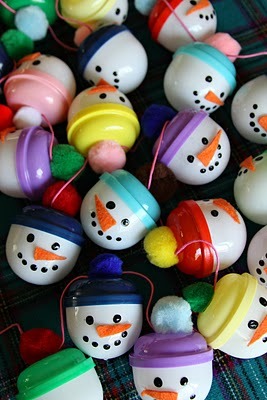 These cute plastic bubble capsule snowmen are such a fun garland idea! Kids will love making them with you and seeing them everyday. And even better, you can use them as a countdown to Christmas by hiding treats inside each snowman. Such a cute idea for an Advent calendar. You can check out the tutorial for this snowman Advent garland over at WhiMSy Love. LOVE this-such a cute & fun idea! This is great...my kids would love to make these! Be sure to visit...I am having a giveaway and would love to see you enter!